This repo contains a PyTorch implementation of the child-sum Tree-LSTM model (Tai et al. 2015) implemented with vectorized tree evaluation and batching. This module has been tested with Python 3.6.6, PyTorch 0.4.0, and PyTorch 1.0.1. Efficient batching of tree data is complicated by the need to have evaluated all of a node's children before we can evaluate the node itself. 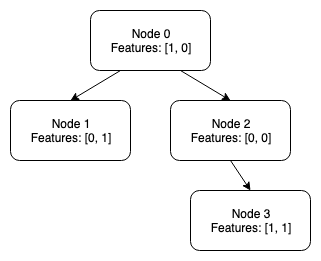 To minimize the performance impact of this issue, we break the node evaluation process into steps such that at each step we evaluate all nodes for which all child nodes have been previously evaluated. This allows us to evaluate multiple nodes with each torch operation, increasing computation speeds by an order of magnitude over recursive approaches. On the first step of the tree calculation, we can evaluate nodes 1 & 3 in parallel as neither has any child nodes. At the second step we are able to evaluate node 2, as its child node 3 was evaluated previously. Lastly we evaluate node 0, which depends on nodes 1 and 2. Doing this we can reduce a four-node computation to three steps. Bigger trees with more leaf nodes will experience larger performance gains. features - A size N x F tensor containing the features for each node. adjacency_list - A size E x 2 tensor containing the node indexes of the parent node and child node for every connection in the tree. node_order - A size N tensor containing the calculation step at which a node can be evaluated. Note that the order that node data is stored in features and node_order must be identical. edge_order - A size E tensor containing the calculation step at which each entry in the adjacency_list is needed in order to retrieve the child nodes for a current node. Note that the order that parent-child data is stored in adjacency_list and edge_order must be identical. The file tree_list.py contains the TreeLSTM module. The module accepts the features, node_order, adjacency_list, edge_order tensors detailed above as input. These tensors can be batched together by concatenation (torch.cat()) with the exception of the adjacency_list. The adjacency_list contains indexes into the features tensor used to retrieve child features for performing sums over node children, and when batched together these indexes must be adjusted for the new position of the features in the batched tensors. Where tree_sizes is a list containing the number of nodes in each tree in the batch. This function is also provided by the treelstm.unbatch_tree_tensor function for convenience. As mentioned above, a tree_sizes list suitable for use by this function is generated by batch_tensors.batch_tree_tensor. Example code that generates tensors for the four node example tree above and trains a toy classification problem against the Tree labels is available in the example_usage.py script.